It’s a new year, it’s a new day, and for many of us that means making resolutions that improve our lives. 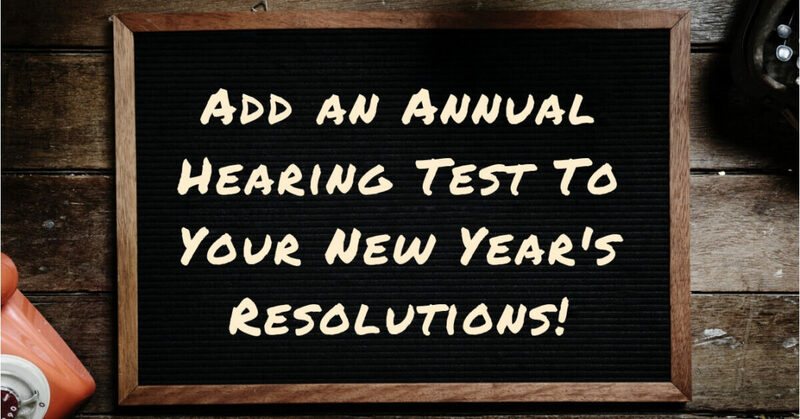 Instead of simply resolving to work out more, eating healthier, or learning a new skill, why not add a resolution that will directly impact our health: test your hearing. Believe it or not, many of us may have unhealthy habits around our hearing health and we may not even be aware of it. Opening the door to improving and protecting our hearing is the first step in establishing the right mindset in embracing healthy hearing. It’s a great situation to be in if you haven’t noticed any changes in your hearing abilities, but the thing about hearing loss is that it happens so gradually that you may not notice it. For the same reasons that you’d get an annual physical or a dental cleaning, getting your hearing checked is important in monitoring your abilities each year. Audiologists and hearing health specialists estimate that people wait roughly seven years from the time they first experience changes in their hearing to the time they decide to seek help. Waiting that long has major implications and negative impacts on our hearing health and well-being. Can you imagine waiting 7 years from the time of being diagnosed with diabetes or high blood pressure before seeking medical attention? Ringing in the ears commonly known as tinnitus. Having a feeling of fullness in your ears. Asking people to constantly repeat themselves or misinterpreting what they’re saying. Constantly turning up the volume on your TV, stereo, or music device. How is Hearing Related to Health? Hearing loss is the third most common medical condition in the United States. It only trails behind heart disease and diabetes. Close to 48 million Americans experience some degree of hearing loss. Hearing loss is often invisible in the sense that people don’t pay much attention to their hearing health until it’s too late. Further, untreated hearing loss also negatively impacts different areas of your life – and this includes your health. Research has shown that there is a greater risk for developing dementia, stress, anxiety, and depression. Additionally, untreated hearing loss has been linked to heightened rates of falls, accidents, and hospitalizations. Allowing hearing to go untreated has considerable negative impacts in one’s life. Not only are you losing the ability to hear, but it transcends to other aspects of your life as hearing is a central component in cognitive communication. Studies have shown that hearing loss leads to social isolation and depression. Imagine not being able to communicate with loved ones as you once used to. That is why it’s critical to treat your hearing loss. Treating hearing loss through the use of hearing devices has been shown to improve relationships, easing tensions around discussions with loved ones or in the workplace, and leading to better communication. Don’t worry if you haven’t gotten your hearing tested in a long time. The hearing test painless and a completely non-invasive procedure that will take around an hour. Once you make an appointment with a hearing health specialist, they will discuss your medical history, conduct a physical exam of your ears using an otoscope, and take a few hearing tests. Tests may include a baseline test, pure-tone test, or a speech recognition test. If you want to learn more about strengthening and protecting your hearing, contact us today at Comprehensive Ear and Hearing. Whether you’re a seasoned hearing aid user, or have never had a hearing test, we will guide you through the process to better hearing health. We’re ready to help you recover your hearing, and preserve your hearing ability with the latest techniques and technologies, and amazing devices with all the programs and settings you need to help you hear. Call us today to schedule an appointment.